I enjoy making treats and snacks that align with the seasons, but there’s only so many leaf cookies you can make for fall. I discovered a wonderful, easy, and fun recipe to make a quick chocolate treat that is perfect for any fall parties. A sweet treat in minutes! Put about ¼ cup of Reese's Peanut Butter Chips in a microwave-safe container. Microwave in increments of 5 seconds, stirring each time, until the chips are melted into a paste. Dip or smear the mixture onto the bottom of an unwrapped Hershey's Kiss. Dip or smear the mixture onto the bottom of a Reese's Peanut Butter Chip. 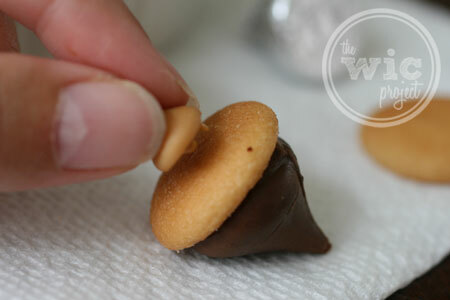 Quickly place the chip in the center of the rounded side of the Mini Nilla Wafer. After all acorns are assembled, let it cool them harden in the fridge for about 10 minutes. This is an easy treat to make using only three ingredients – Mini Nilla Wafers, Reese’s Peanut Butter Chips, and Hershey’s Kisses. First, you’ll need to melt down some of the chips. You’ll use this mixture as a glue to stick the kiss and the chip to the wafer. I started out with 20 seconds and then 5 seconds after that, making sure to stir each time. It took a total of 35 seconds for my chips to melt down. Then comes the fun part. 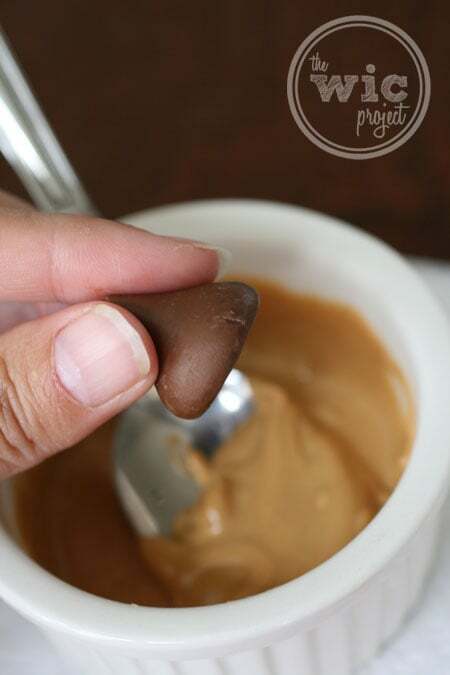 Dip the flat side of the Hershey’s Kiss into the melted peanut butter chips. You can also use a knife to smear it on. 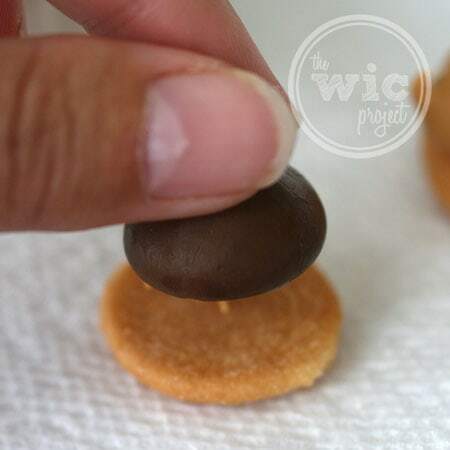 Dip the flat side of a peanut butter chip into the melted chips, and quickly put it in the center of the rounded side of a Mini Nilla Wafer. Once all of the acorns have stems, put them into the fridge for about 10 minutes to let them harden. If you’ve found that the melted peanut butter chips have hardened, you can nuke again in increments of 5 seconds until it is smoother and easier to work with. Also, chocolate melts, so try to dip and place the Kiss onto the wafer as quickly as possible, otherwise (or fortunately?) you’ll end up with some melted chocolate on your fingers. I think this is a really neat, unique idea ! How perfect for fall days ! Yum, I want one! It’s kind of like a s’more, except cuter and with peanut butter instead of marshmallows. These are adorable, and they look so yummy!! These are just precious! I can’t wait to make them with the kids! Thanks bunches! What a cute idea! 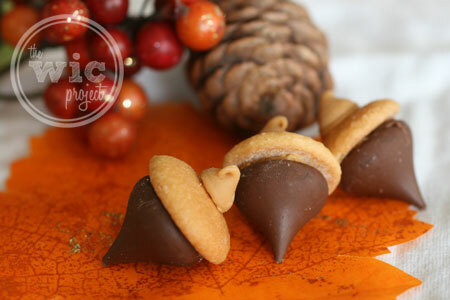 I’ll be making these as a fun treat to take to work! Such a cute, easy idea! I love that it comes together so quick, and they look yummy! OMG! These look both delicious and really cute! 🙂 Thanks for sharing! awesome, these look tasty and sounds like it’s going to be super easy to make. I think this will be added to my list of goodies that I’ll be making and giving out to everyone for Christmas!! Thanks for sharing!! These are so cute! And they look pretty easy! When I saw the name, I thought “How on earth can you make acorns to eat them?” lol. I think i alraedy have these ingredientd in my cabinet! A really cute and simple Goodie! What a great idea and so easy to make. such a cute idea!!! 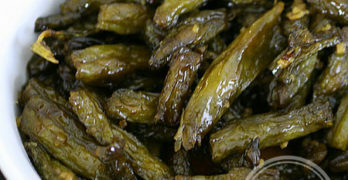 I love it and plan on trying these for our next get together! Oh sweet ! These are so cute, I’m defiantly making some of these.. I love recipes that are simple yet delicious. 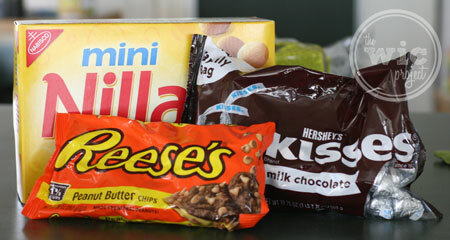 You can’t go wrong with this combination, but you can make other variations using fdifferent flavored chips and kisses. These are so cute and sound yummy.Pinning! these are so adorable!! And, my brother will freak for them, because he LOVES chocolate and peanut butter! These are so cute. They would be great for in the Fall around Halloween for the kids too. They look so good I want to make some of them right now. I can’t wait to make these with my grandkids!! !